* This class has prerequisites. See below. Build a unique slab bench or small table in this six-session class. Create a piece that highlights the natural beauty in a slab's swirling grain or intriguing color known as spalting. 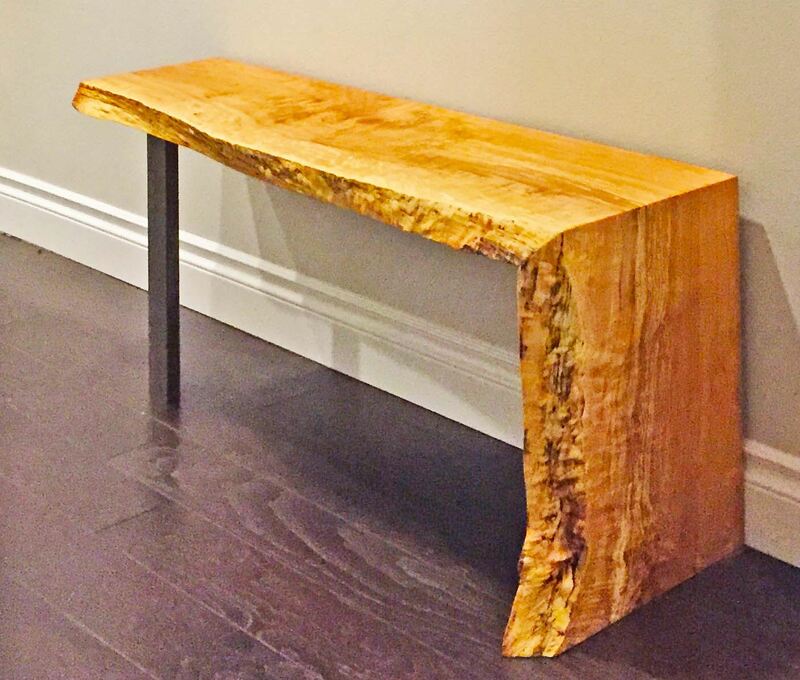 Preserve a live edge, rip a straight-line edge or combine the two styles into your design. At the first session, the instructor will discuss design considerations, suitable wood and several options of styles for top and base. The instructor will walk you through the process of drawing up your design ideas into working plans. The next sessions will be devoted to building your project and preparing it for final finish. The final session will cover finish options and application techniques. You will go home with enough finish to apply multiple coats to your completed project. * To take this class, you must have completed our free, one-hour Orientation to the Woodshop class plus Woodshop Tool Safety Checkout 1 and 2. If you haven't taken these classes, please register for them before you sign up for this class. The $35 materials fee covers epoxy and other shop materials. You will need to supply the wood for your project. You can buy wood from BARN, purchase it elsewhere or bring what you have from your wood stash. Registrants will receive information about how to select appropriate wood. 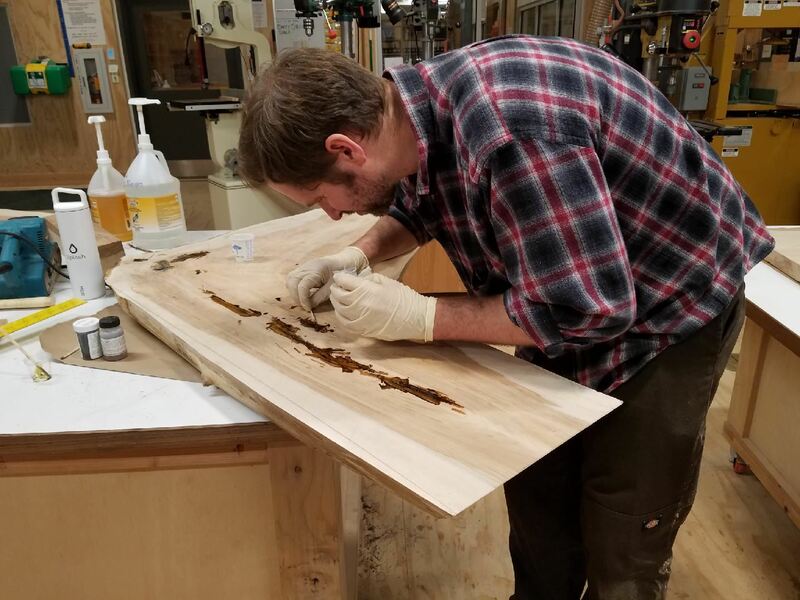 The moisture issues associated with use of BARN's SawStop table saws aren't critical for this project unless your slab is thicker than 2 inches. You will work at your own pace, but you should be prepared to spend additional time during Open Studio times between class sessions, if necessary to complete your project. Open Studio is always free for members. Non-members can also use the shop during these times without additional charge while working on a class project. You will be able to store your wood in the woodshop between sessions. "An inspirational class! So much cool stuff to practice on many slab projects to come!!" 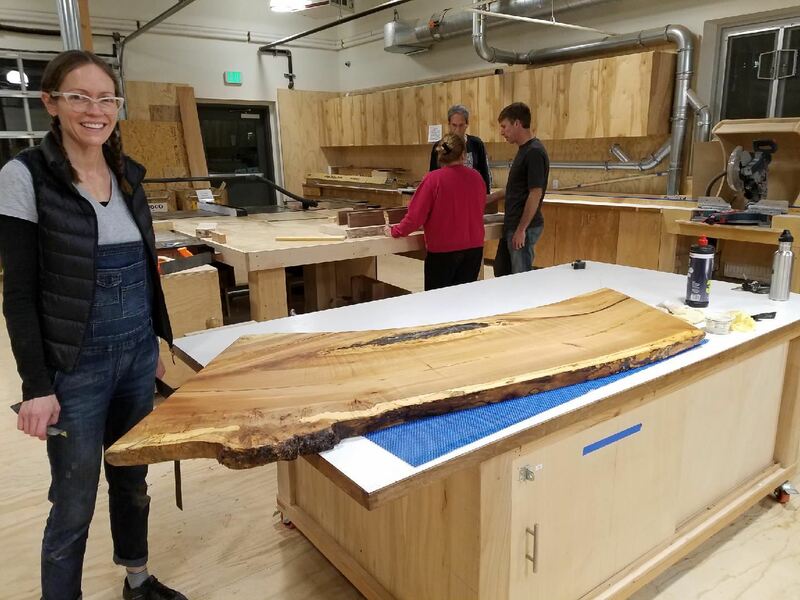 Instructor: Carol Fiedler Kawaguchi is a professional woodworker who specializes in restoration of antique furniture through her business, C-Saw, on Bainbridge Island. She also makes custom furniture, including the slab coffee table in the Commons at BARN. Marvin Crosland and Mo Ellis will assist.